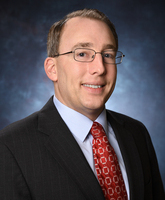 Mike Crabb, AAMS® is a Financial Consultant with Synergy Financial Group, joining the firm in May 2012. He is a 2001 graduate of Western Maryland College, now McDaniel College, where he obtained a degree in Communications and Economics. He is a member of the College of Financial Planning and holds an Accredited Asset Management Specialist certification (AAMS®). Prior to joining Synergy, Mike worked for a national financial institution for several years. There he obtained his series 7 (held with LPL Financial) and 66 (held with LPL and Synergy Financial Group) registrations, respectively, as well as his life and health designations. By working with local business owners, professionals and retirees, Mike strives to design a custom plan to work towards each client’s individual needs. Mike lives in Catonsville with his wife, Amanda, a Baltimore County teacher. They both are active members of the Catonsville Methodist Church where Mike has served on various leadership boards. While an active member of his local Chamber of Commerce, Mike is also involved in many of their community endeavors.